It has been an interesting spring here in Cusserland, I can tell you. We had moving and injuries and illness and the sort of concatenation of crappiness that tests a person’s mettle and makes one profoundly aware of the difference that good, kind people can make when you’re neck-deep in it. Even knitting didn’t help. Things were dire, indeed. Slowly, slowly, the storm waters are subsiding, and as they do, I realize that almost without me knowing it, my hands have been making things. In the occasional stolen moments — a few rows before bed, a couple of rounds in a waiting room — these projects have quietly progressed until this past weekend I knit the last stitches on three projects in as many days. Three! It felt like the sun coming out. It felt like an omen of good things to come. I may or may not have done a bit of a victory dance. What did I finish, you say? I’m so glad you asked. 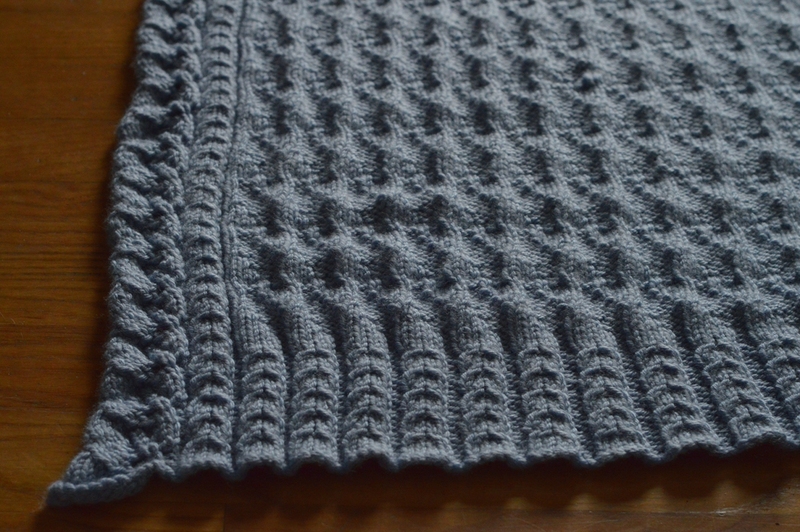 Next up, another Saturnalia Infinity Scarf, this time in sport weight. 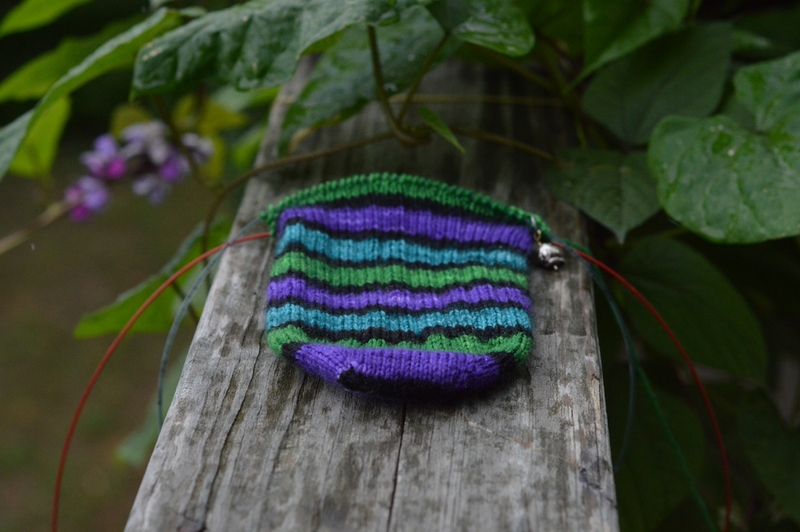 I’d been meaning to figure out the numbers for a heavier Saturnalia since releasing the pattern, and it’s such an easy, portable project that it pretty much finished itself. The new information, along with some modeled photos, will go into an updated version of the pattern in the fall. This version is in Astral Bath Tesseract, in Gargoyle (the lighter, bluer grey) and Foundry. 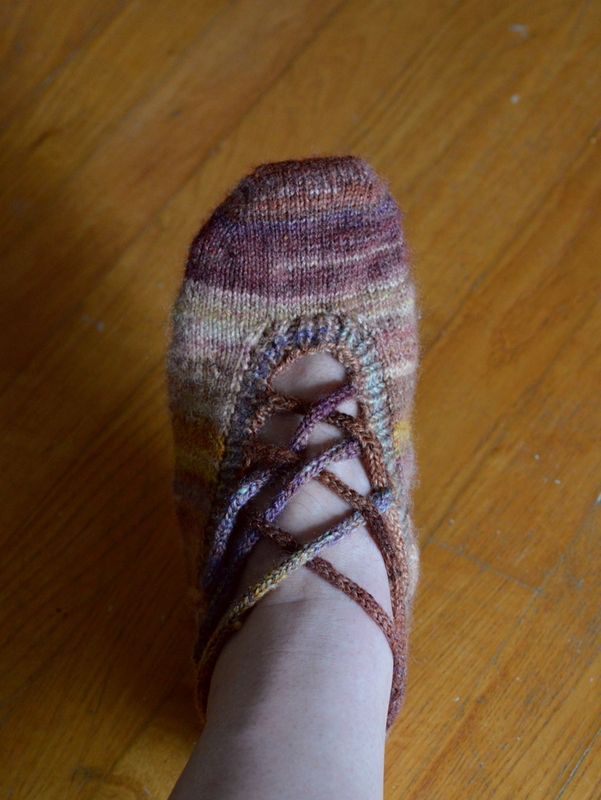 Finally, a slipper, made with some leftover handspun (Pigeonroof Studios BFL/Silk in Liberty). Yeah, I’m counting one slipper as a project. It was an experiment/prototype/me noodling around with an idea, and it didn’t turn out as I’d envisioned, so it won’t be getting a mate. However, I think the idea is sound if the execution was…er…not, so at some point I’ll futz around with it again. 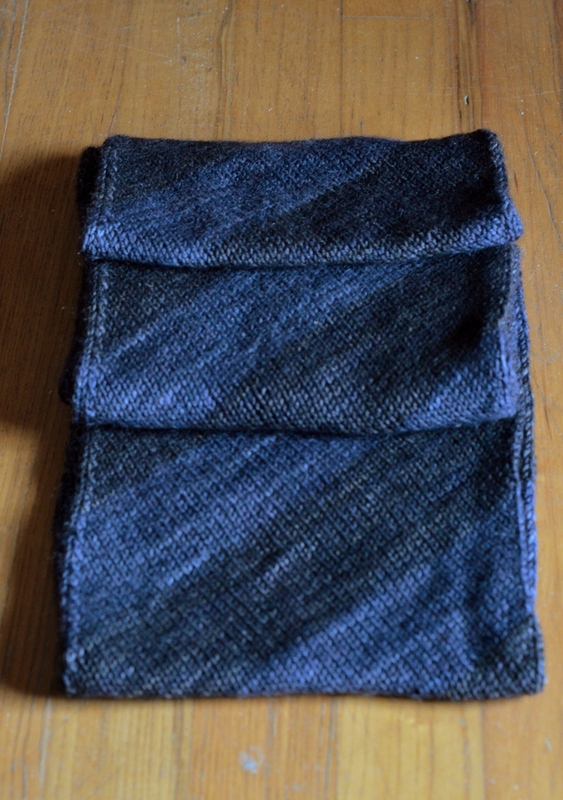 I just need to do the seaming and the button band. 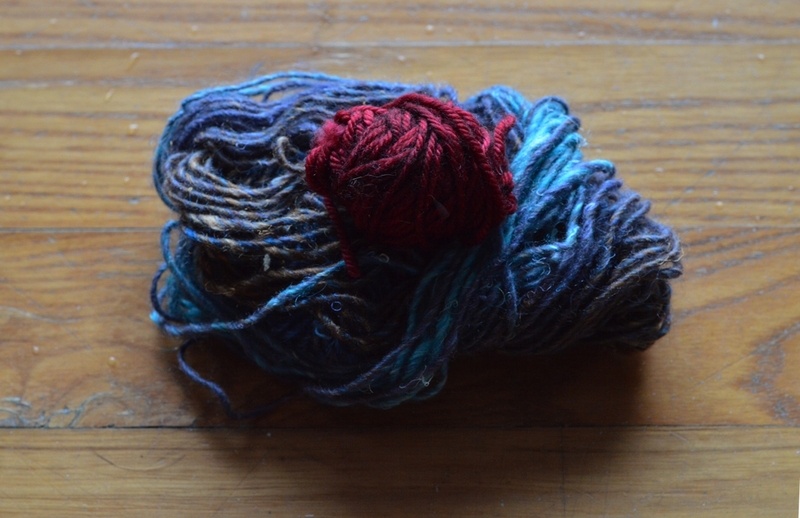 Alas, I had envisioned the button band in red, and that tiny ball is all that’s left, and I had to unravel the swatch to get as far as I have, so it’s off to the yarn store to see if I can get a skein to match. Thanks! I think if I a) make it smaller overall so that it, I dunno, maybe fits properly, and b) make the open part larger and the slipper part smaller, it’ll be pretty neat. Knitting didn’t help??!! Yikes, things must’ve been BAD. Hope life is improving. Your FOs are beautiful, and I especially love the slippers. Who’d have thought it was even possible? Knitting *always* helps. Things are so much better now, though, thank you. I am delighted that your life is calming down enough that these beautiful things are again issuing from your (happier) hands.